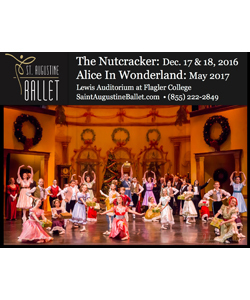 Saint Augustine Ballet's Nutcracker is a holiday tradition that's fun for the whole family. The multi-generation cast is a blend of local dancers and celebrities performing alongside world class guest dancers. This magical production will be performed in the Lewis Auditorium at Flagler College located at 14 Granada Street in historic St. Augustine.